Today I have the pleasure of reviewing the Pampered Chef Quick Cooker. It’s a high-end pressure cooker that gives users the ability to customize pressure levels. It comes with clear Getting Started Guides that are perfect for novices and offers an awesome accessories package that will please even pressure cooking veterans. Sarah, a Pressure Cooking Today reader, recently wrote to share her experiences with her Pampered Chef Quick Cooker. 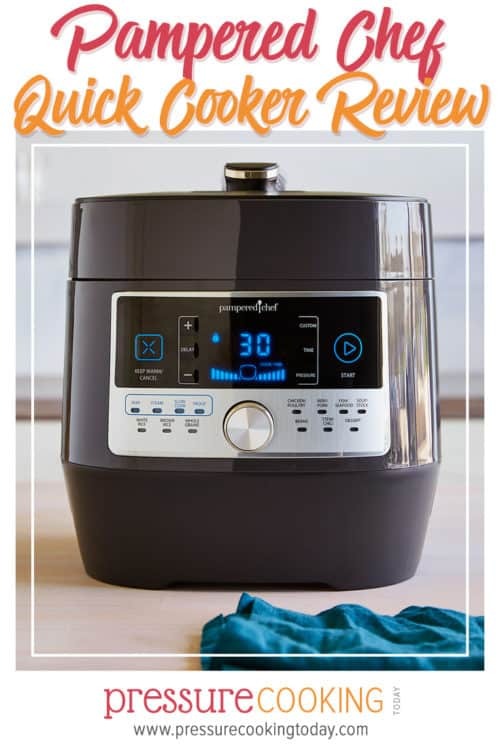 I’ve been dying to learn more about the Quick Cooker ever since it was released in September, and Sarah played matchmaker to get me in contact with Pampered Chef, which sent me a 6-quart Quick Cooker to test out! The Quick Cooker is one of the more expensive electric pressure cookers on the market. However, like most Pampered Chef products, it is beautiful and well-built, and it offers features that other pressure cookers don’t have. Pampered Chef has generously donated a Quick Cooker and Accessories package for one lucky reader. Details on how you can win are at the bottom of this post. The Quick Cooker has a clear LCD display and combines a dial and push-button controls. The controls take a bit of getting used to, but I did love that the custom, time, and pressure level settings are all push-button, so I don’t have to scroll through a long menu to set a custom cook time. The dial allows cooks to toggle through the preset cooking programs. 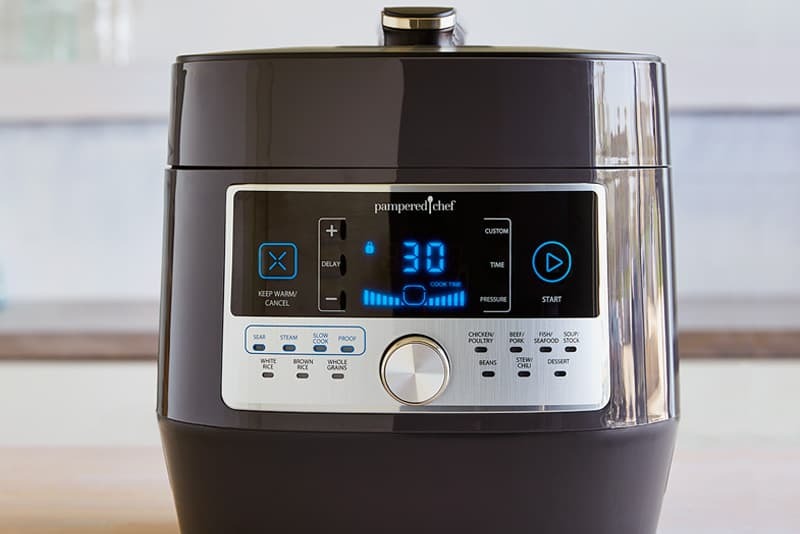 Like most electric pressure cookers on the market, the Pampered Quick Cooker has preset cooking programs like Chicken and Rice as well as the ability to set a custom pressure level and cook time. While I generally cook with a custom setting, I am very excited to take advantage of the proofing setting for making breads and sweet rolls. On the preset cooking programs, the pressure level cannot be adjusted but the default cook time can be adjusted. It has a plastic casing that covers the entire pressure cooker, so it’s easy to wipe clean. The lid is also fully encased in plastic. When I used it the first time, I was surprised at how cool the lid stayed—the plastic casing on the lid means there are no metal “do not touch” spots to avoid and I could just place it upside down on the counter when I was done cooking. I really like the button to activate the pressure release. It’s a large button midway on the handle and keeps your hands away from the release valve. You simply set and reset the release valve by pressing the button. This can be helpful if you need to use an intermittent release. For comparison, while the inner stainless steel pot is about the same size as the 6-quart Instant Pot Duo, it’s about a pound heavier and slightly larger due to the rounded-corners square shape of the Quick Cooker. However, this extra size comes mainly from the built-in handles that are on the sides that make it easy to carry around. It took a few attempts to get used to using the handles, but they’re one of my favorite features now. The Quick Cooker comes with a trivet as well as a getting started guide, reference guide, cooking guide, and manual. These guides are written to give new pressure cooker users confidence as they get to know their machine. These guides also have useful cooking charts divided by ingredient type as well as recipes and beautiful photos. The Quick Cooker comes with an optional accessories package. The package includes a springform pan, a ceramic pot with a silicone stretch-fit lid, and a wire cradle (a metal sling that fits perfectly with the pot and pan). I was impressed with their quality. The ceramic pot is substantial—heavier than you expect. It has a neat little silicone cover that fits tightly over the pot and ensures you’ll never need a foil cover. The springform pan fits together tightly and doesn’t have a rim to catch water while cooking. 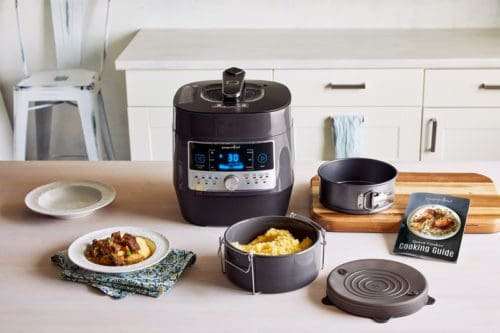 Both the springform and the ceramic pot are oven-safe and can go directly from the Quick Cooker to the oven—a major plus when making foods like Au Gratin Potatoes. Pampered Chef also sells spare silicone rings (a must for cheesecake, in my opinion), an extra trivet, and extra stainless steel cooking pots. I REALLY love these accessories. They’re well thought-out and high quality. 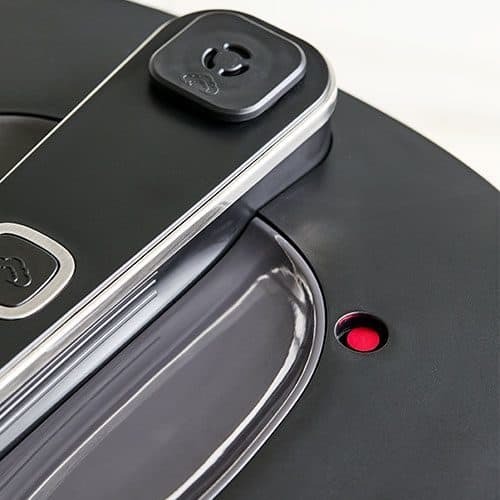 The manual specifies that the springform pan and the ceramic pot are designed to work with the Quick Cooker’s included rack and that they haven’t been tested with other pressure cookers. If you’re not in a position to invest in the Quick Cooker, I think that starting off with just the accessories package is a great way to go. To test out the Quick Cooker, I tried out the preset settings using their recipes provided and tried the manual setting for some of my favorites. From their recipe book, I tested their Pot Roast with Mashed Potatoes because I wanted to know how the Quick Cooker handled meats. Could it keep it moist without making a gravy? I also wanted to try the ceramic pot with the wire cradle. I was unsure about cooking potatoes for the same amount of time as the roast, but the potatoes turned out great. The thick ceramic pot helped slow the cooking of the potatoes, and it was convenient to mash the potatoes in the same pot they cooked in. One thing to note: I have found the Quick Cooker Sear setting runs a little hot. For browning meats this generally isn’t a problem, but you will need to keep a closer eye on your food when using the Sear setting and maybe shorten the searing time. You’ll also want to have a little water or broth ready just in case, especially with vegetables, onions, or garlic. Under the Sear setting, we are trying to facilitate the Maillard reaction to develop great crusts and fonds quickly, which typically needs a temperature above 300 degrees F to begin to achieve effectively. We wanted our unit to reach this sear temperature range very quickly, and typically the food items are tended to during this function. However, there is another way to control the heat at a lower level. You can use the steam setting, which will control the temperature to 212 degrees F, which would work well for your delicate sauces, etc. You can also modulate the sear setting by hitting cancel if you notice it getting too hot for what you are trying to achieve. I also tested Mongolian Beef with White Rice and Pumpkin Pie Steel Cut Oats in the Quick Cooker. Both meals turned out great. There was a little less liquid loss than in some of my other pressure cookers, so I had to let the oats sit and thicken for a little longer than usual. Ultimately, this is a high-quality pressure cooker! Those who love the Pampered Chef brand will love their take on the electric pressure cooker. I also highly recommend the accessories package to those who already have a pressure cooker. Is the promosimple entry form not loading properly for you? 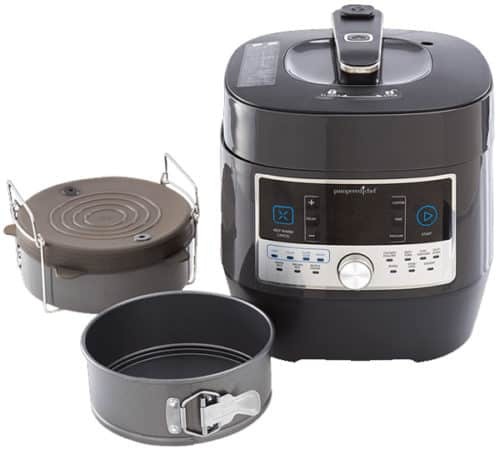 You can also enter by visiting https://promosimple.com/ps/d9d8/pampered-chef-quick-cooker-and-accessories-giveaway. Disclosure: I received a free Pampered Chef Quick Cooker with Accessories to review. I was not compensated for this post and all opinions expressed are always my own. Are the settings the same between an Instant Pot and the Quick Cooker? I’m wondering if I can use IP recipes with the QC. Hi Lindsey – yes, you can use Instant Pot recipes in the Quick Cooker. The settings may not be the same, but just adjust the time to the time in the recipe. I just got my pamper chef quick cooker I want to know if I can, can meat in this quick cooker. I can not find any info on canning meat. Thank you. I just had a pampered chef party and was introduced to the quick cooker. I have a conventional presto pressure cooker that I use occasionally it am afraid of burning myself or having the lid blow because of too much pressure. This looks easy and safe to use. Would love to win one. Thanks Barbara – the giveaway has ended. The nice thing is that you can actually gather friends, get to try out the cooker before you buy one, and then earn host benefits so that you can get your Quick Cooker free or half price. Simply go to PamperedChef.com and request a consultant near you. You can also host online parties but they are not nearly as fun or useful since you can’t try the cooker or the resulting amazing food over the internet. Love Pampered Chef , but all of mine are very outdated. Seems like everyone is jumping on the electric pressure cooker bandwagon. It will be interesting to see how all the different brands hold up. I have been following your site and posts for the convenience of recipes to adapt to my Quick Cooker. It has changed the way I make meals for my family. I just love it. I’m a consultant for Pampered Chef and I appreciate your honest review. I’m happy to be a resource if questions exist on the QC and its adaptability. The accessory set is as beautiful as it is useful and practical. I’m able to provide hot meals that would otherwise not be possible if it were not for the efficiency of this product! I know I live in Australia and this probably is for US citizens only, but for such a great cooker its worth it. Hi Ruth – sorry, it is for US citizens only. I’m not sure if they sell Pampered Chef in Australia? Hi Ruth, I’m not sure I can ship to Australia — but I would look into it for you as I’m a consultant. I swear by this Quick Cooker. It’s absolutely and completely changed the way I can cook for my family! Wow what a beautiful pressure cooker. 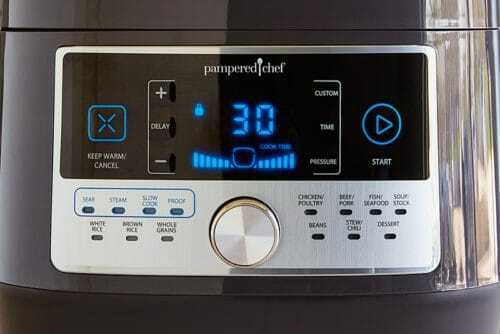 I have quite a few Pampered Chef items I’ve bought over the years that I use all the time and love-I have no doubt their pressure cookers are very high quality. That’s one nice accessory package too! How does this compare next to the Ninja Foodie? When you reported on the foodie, I was very impressed. I went right out and bought one. I love it, it does everything it says it does. I have a Nuwave 6 qt, and a consori 2qt, love them both. Can not afford to buy another one HE HE HA HA. I recently went to a pampered chef party and she demonstrated the pressure cooker. Even though she had used it many times before it would not come to pressure. She was doing a pot in pot dinner. She finally decided that there was too much chicken in the pot. Anyway that being said I am sure it was just a fluke. I was impressed with all the neat features. If you never had a modern PC you probably wouldn’t appreciate all the new bells and whistles.